Image caption The DVLA's chief executive tweeted "a little prototype of something we're working on"
The UK's Driver and Vehicle Licensing Agency is working on a smartphone version of its driving licence. Chief executive Oliver Morley tweeted a photo showing a "prototype" using Apple's Wallet app on an iPhone. He says it will be an "add-on" to the plastic card rather than a replacement. Wallet already stores boarding passes and credit, debit, gift and discount cards. Payment information is encrypted end-to-end and authorised with the user's fingerprint or passcode. CCS Insight analyst Ben Wood said: "Security has taken a significant step forward to support digital payments on phones, so the framework is in place for other secure applications, such as a digital driving licence. "There are not many people in the UK that do not carry a smartphone with them every day, so it is a logical next step." "People are getting more and more used to the technology because of e-ticketing," he said. "People are far more comfortable with the concept of keeping key information on their smartphone." DeLaRue, which prints British banknotes and passports, has already said it is working on a paperless passport. And the NHS has announced a £4bn plan to move to a "paperless" platform. Morpho Trust, a US security company that provides driver's licences, has been piloting a digital licence product in Iowa since August 2015. And in Australia, the New South Wales government has announced the introduction of digital licences, which it says will eliminate the need for a physical card. The first licences issued under the new system are for fishing, the purchase of alcohol, and responsible gambling. 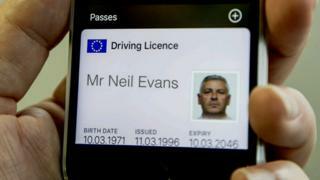 A driver's licence is due to be available in digital format by 2018.